Obituary for Billy Ray Shanks, Sr.
Billy Ray Shanks, Sr., 85, of Dearborn, MO passed away Saturday, December 1, 2018 at Oak Ridge of Plattsburg, MO. Billy Ray was born June 13, 1933 in Dearborn to Robert Thomas and Ulah Irene (Farr) Shanks. He was a graduate of the Dearborn High School, and lifelong resident. Billy Ray married Dollie Mae Botts on August 12, 1953 in Clovis, NM; where he was serving his country as a member of the U.S. Airforce, during the Korean Conflict. He spent his 43 year career working for the Gould (GNB) Battery factory in Leavenworth, KS; where he was a forklift operator, and later handled inventory. 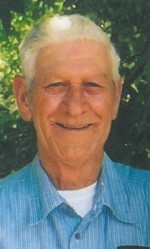 Billy Ray liked to fish and enjoyed woodworking projects to help his wife with various crafts. He was known among his friends, for his tremendous sense of humor, and every morning, when Billy Ray would join his friends for coffee, they would greet him with a cup absolutely “filled to the brim”, just to get him started. One of Billy Ray’s passions in life was attending various high school sporting events with his friend J.C. Roberts. They went all over the state following the events and were fixtures well known for “their spot” across the field. Billy Ray was preceded in death by: his parents; his wife Dollie Mae; and a son Billy Ray, Jr. He is survived by: a son Lonnie Shanks; a daughter Diane (Jerry) McKown; 4 granddaughters Tina Martin, Jamie Erisman, Summer Black, and Heather Shanks; 6 great grandchildren Anthony Martin, Jesse Martin, Cameron Leupold, Alyssa Szczygiel,, Danyelle Chadwick, and Riley Calhoun; and 2 great, great grandsons Karson and Kade. A visitation will be held 10:00 – 11:00 a.m., Thursday, December 6, 2018 at Vaughn-Aufranc Funeral Home in Dearborn; followed by an 11:00 a.m. funeral service. Interment will follow at the Dearborn Cemetery. Memorial contributions can be given to the charity of one’s choice. To send flowers to the family of Billy Ray Shanks, Sr., please visit our Heartfelt Sympathies Store.